Coming into Friday’s game, with the chance of playing in the Mountain West Championship game gone, the San Diego State football team was playing for pride and a chance at a better bowl bid. 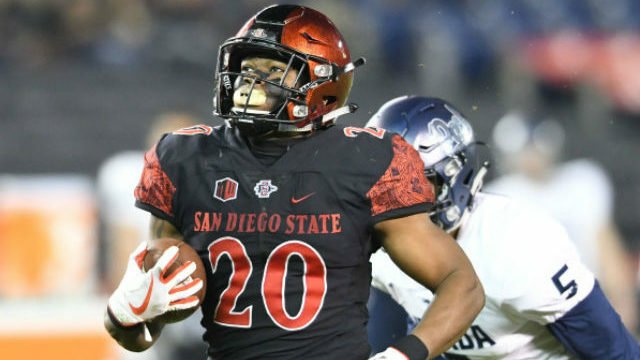 Playing his last regular season college football game, senior running back Rashaad Penny proved that pride could be a great motivator. Snubbed by the Doak Walker Award for the best college running back in the nation, the NCAA’s leading rusher became the 29th person to break the 2,000-yard rushing mark in the 35-10 win against New Mexico (3-9, 1-7) at SDCCU Stadium. But Penny doesn’t see it that way. His record-breaking performance is just how it is. Pride wasn’t a factor. 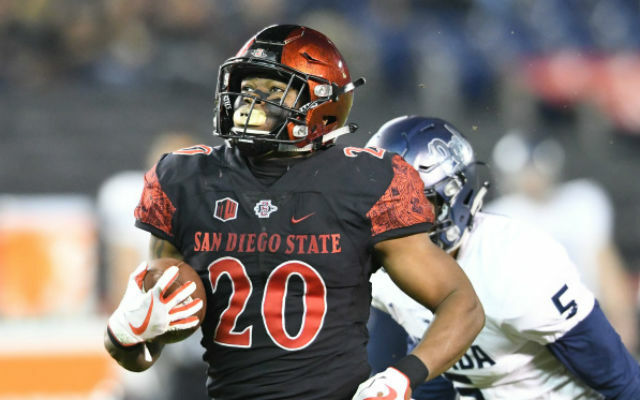 Penny reached that the 2,000-yard milestone in the early third quarter when he broke through a tackle and ran for 51 yards up the middle for a touchdown to give the Aztecs (10-2, 6-2 ) a 21-0 lead. He rushed for 22 times for 203 yards and two touchdowns. This was Penny’s fourth straight game with more than 200 yards rushing and his fifth this season. And was Penny mad about being snubbed? Not in the least bit, he said. “Yeah, we do,” senior fullback Nick Bawden interjected. SDSU also made history by becoming the first FBS school to have back-to-back 2,000-yard seasons by two different backs. Donnel Pumphrey set the school record with 2,133 yards last year and Penny only needs 107 yards to break that record in the Aztec’s upcoming bowl game. Friday’s game was also Senior Day, where SDSU honored the 19 seniors who contributed to the school’s most successful run in the past four-plus seasons. During that time, the Aztecs have won two Mountain West championships, three division titles (some of which were shared), won three bowl games and played in four, and posted a 47-17 record. Now, San Diego State waits for an official bowl bid. SDSU was guaranteed a bowl bid when it won its sixth game this season on Oct. 7. The Aztecs are projected to play in the New Mexico Bowl on Dec. 16 or the Hawaii Bowl on Dec. 26.